Coral baby penstemon (Penstemon x “Coral baby”). This is a new plant with upright spikes of coral-pink flowers that bloom from May through July in Zones 5 – 8. It takes moderate to dry water conditions once established and prefers sandy, well-drained soil. I love to see hummingbirds on penstenoms. Plant Select says Coral baby also attracts bees and butterflies. The plant was selected by breeder Kelly Grummons of Denver, who specializes in xeric plants. Plant Select’s 2015 Coral baby penstemon for Zones 5 to 8. Image courtesy of Pat Hayward, Plant Select. WINDWALKER royal red salvia (Salvia darcyi x S. microphylla). I like that this hummingbird attracter is deer resistant. Plant Select says that it produces blood-red blooms from June through October in Zones 5 to 9. Cutting the salvia back in early summer can reduce its height (which can reach up to 58 inches). WINDWALKER salvia likes full sun and is moderate to xeric in water needs. It’s also from Kelly Grummons of Denver. 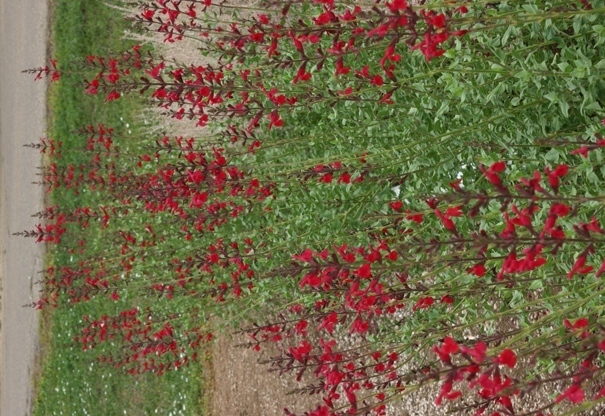 Plant Select’s WINDWALKER Royal red salvia, a new plant for 2015 that produces blood-red blooms all summer. WINDWALKER big bluestem (Andropogon gerardii “P002S” grass. This new introduction from Plant Select for 2015. Bluestem grass is one of the most beautiful ornamental grasses, and grasses can make a great statement in a xeric landscape. I especially love them near walkways or up against rocks. The powdery blue foliage on the WINDWALKER big bluestem can grow up to 6 feet tall in Zones 5 to 8. We left our bluestem through fall and enjoyed the dried foliage in the winter wind, then cut it back to the ground in early spring. It grew back, but was not as hardy the next year. This variety was selected by Sunscapes Nursery, and should reward with purple plumes in fall. It should get by with moderate water or dry conditions. Plant Select’s new introduction WINDWALKER big bluestem grass is a perfect choice for a breezy xeric garden. Image courtesy of Scott Skogerboe and Plant Select. Engelmann’s daisy (Engelmannia peristenia). This is one of several recommended plants from Plant Select for 2015. Because it’s native, it should adapt to high desert climates and water conditions. These grow wild at our place and when we head out to mow down weeds, we try to mow around them. They grow about 2 feet tall and are filled with yellow daisy blooms in late summer that attract pollinators. In the garden, plant them in part shade to full sun in Zones 5 through 10. Engelmann’s daisy, one of Plant Select’s recommended plants for 2015 because of its adaptability to all sorts of conditions. Visit Plant Select to learn more about their selection process and 2015 recommendations. I’ll probably include a few more in future posts. And if you live in the high desert or intermountain West, ask your local nursery if they stock any of the Plant Select recommendations.